Are we hindering children from coming to God? We all know the verse. We all knew what happened. But are we committing the same mistakes as the disciples? 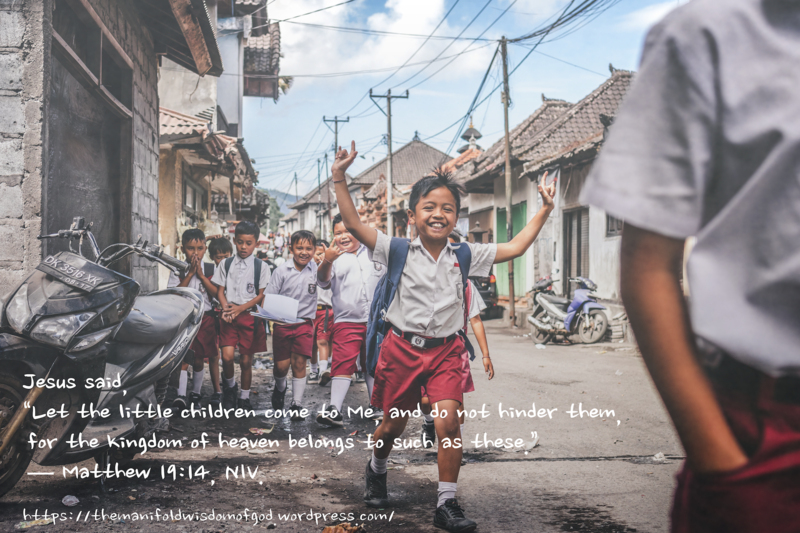 Are we hindering children from coming to God? Do you know what do children need in order to come to God? Is bringing them to church and Sunday school sufficient? Teach them (the commands of God) to your children, talking about them when you sit at home and when you walk along the road, when you lie down and when you get up. Write them on the doorframes of your houses and on your gates, so that your days and the days of your children may be many in the land the Lord swore to give your ancestors, as many as the days that the heavens are above the earth. Next The very real effects of cosmic powers and God’s sovereignty over them. This is SO. unspeakably important!! The problem with today’s world is that parents are too fixated on their own lives, their own careers, and whatever have you. Children are often left to the church for a few hours a week then left to manouveur life’s challenges. It’s no wonder morals are degrading and children are leaving God. We need to pray for wisdom on how we should guide these children back so that our future generations may once again be aligned to God. Yes and AMEN!! Lord Jesus, strengthen and empower us for this responsibility!